2. 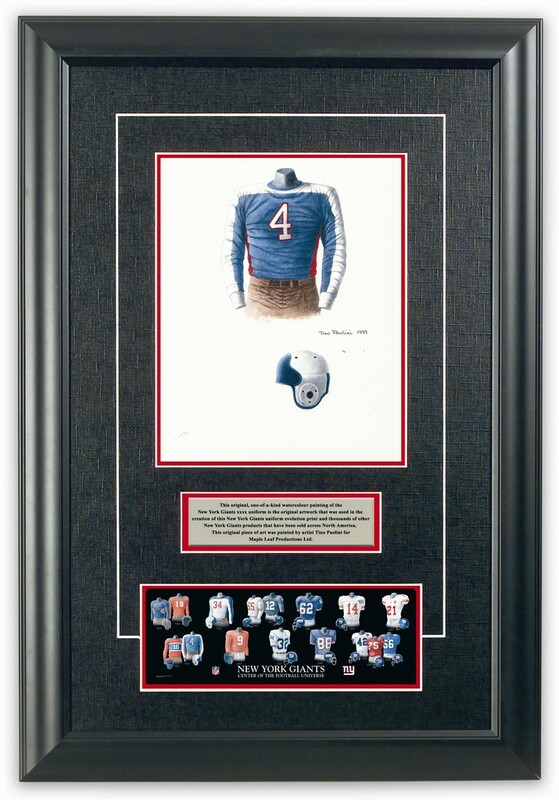 Please note that all of the actual original, one-of-a-kind artwork of the University of Florida State football uniforms as seen in the poster above are actually available for sale. These watercolor paintings are truly beautiful, original watercolor paintings, and there are only 14 of them so please act quickly if you would like to buy one. These would make a wonderfully memorable, beautiful and completely unique gift for someone who loves Florida State football. 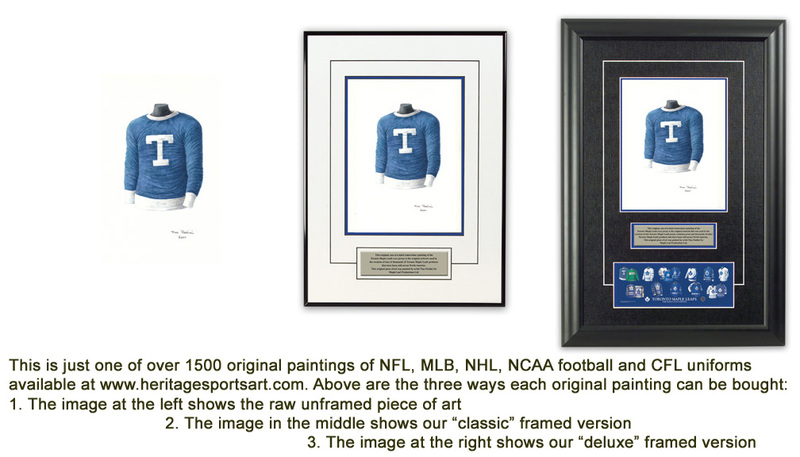 If you would like more information about this great artwork including the three ways you could purchase each piece, please visit our Florida State YouTube video at www.youtube.com/watch?v=ZVu1f5b4yKM or go directly to the artwork website www.heritagesportsart.com/Florida-State-Seminoles-c83/ where you can see and purchase the artwork. Florida State University is located in Tallahassee, Florida. The school, which was founded in 1851, has an enrollment of 38,553 students. An argument can be made that the school’s first football team was in 1904, although modernists say that they first played in 1947. The Seminoles football team plays out of Doak S. Campbell Stadium which seats 82,300 spectators. The ‘Doak’ opened for play in 1950 and has seen numerous renovations and expansions, most recently in 2003. Florida State boasts an excellent tradition of football success; countless Seminoles have extended their football careers in the NFL, Arena League and the CFL. Notable Seminole alumni include: Fred Biletnikoff, Deion Sanders, Charlie Ward, and Chris Weinke. If Florida State was nationally ranked in "The Top 20" (or Top 10 in some years) in a particular season depicted in the poster, we show the team’s ranking. That being said, prior to 1936 there was no nationally recognized poll ranking the nation’s top teams, so you will not see any rankings prior to 1936. This painting depicts the 1904 Florida State College football team uniform. Football ceased to be played at Florida State following 1904. The Buckman Act, abolished the game, among other things, and many of the school’s male students transferred to the University of Florida. The 1904 team captured the state championship despite a 2-3 record. Jack ‘Pee Wee’ Forsythe patrolled both the sidelines and the backfield for FSC in 1904. FSC players in 1904 wore gold, long-sleeved jerseys with horizontal purple stripes. The pants were tan-colored and players also wore a tan-colored nose-guard for protection. It is sometimes overlooked that the history of Florida State football actually pre-dates the 1947 founding of Florida State University, and goes all the way back to the early 1900’s as shown in this uniform. This uniform was worn by the 1904 Florida State College championship team. When Florida State College became Florida Female College in 1905, the football team was forced to attend the University of Florida. 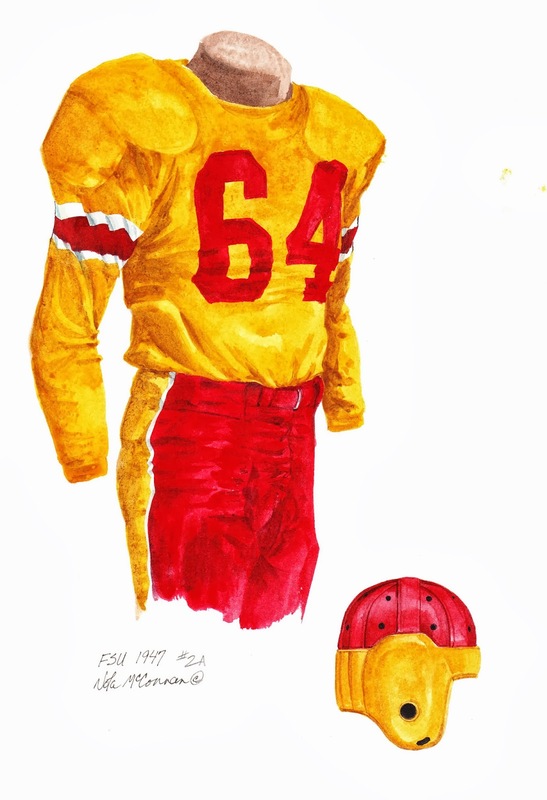 This painting depicts the #64 Florida State University football team uniform from 1947 that belonged to Tackle, D.L. Middlebrooks. In 1946, Florida State University became a co-educational institution once again when the first male students were enrolled, most of who were coming back from World War II. 1947 marked the return of football and the squad was coached by Ed Williamson. Despite an 0-5 record, Seminole football was ostensibly reborn. On October 18th, players sported garnet and gold, FSU’s now signature colors for the very first time. Seminole footballers wore gold jerseys with garnet numbers on both the front and back of their uniforms. Garnet and white stripes adorned the long sleeves at the elbow. The pants were garnet with a gold and white stripe down each pant leg. Players also wore helmets for protection that were also garnet on the crown and gold below. Remarkably, it only took FSU one year to reorganize and establish an excellent athletics program. Despite an opening day loss to Stetson, 7,165 fans witnessed the rebirth of Seminole football at Centennial Field on October 18, 1947. This painting depicts the #48 Florida State University football team uniform from 1954 worn by quarterback Len Swantic. The ’54 Seminoles featured a freshman from West Palm Beach, Florida named Burton Leon Reynolds. 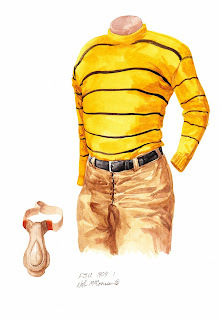 He was known as Buddy then; later, the world would know him as Burt Reynolds. Reynolds, who wore #48, showed definite promise in the FSU backfield but unfortunately his football career was cut short during the winter break of 1954. He was involved in a near-fatal car accident that permanently damaged his knee. The ’54 Seminoles were coached by Tom Nugent who led the squad to an 8-4 record including a Bowl appearance, a 47-20 loss to Texas Western on New Years Day. Seminole footballers sported garnet jerseys with white numbering on both the front and back of their uniforms. Jerseys also featured white striping on the elbow-length sleeves. Players’ pants were white with a thick garnet stripe down each leg. Helmets were gold with a garnet stripe down the center. Up-and-coming college football star-turned-actor, Burt Reynolds played in FSU’s backfield in 1954. Reynolds wore the #26 and #46. This painting depicts the #20 Florida State University football team uniform from 1958 that was worn by Seminole great, Bobby Renn during his senior year at FSU. Renn is a member of the Florida State Football Hall of Fame. Renn played one season for the AFL’s New York Titans. Renn and quarterback Vic Prinzi captained the ’58 Seminoles and led the squad to a 7-4 record. 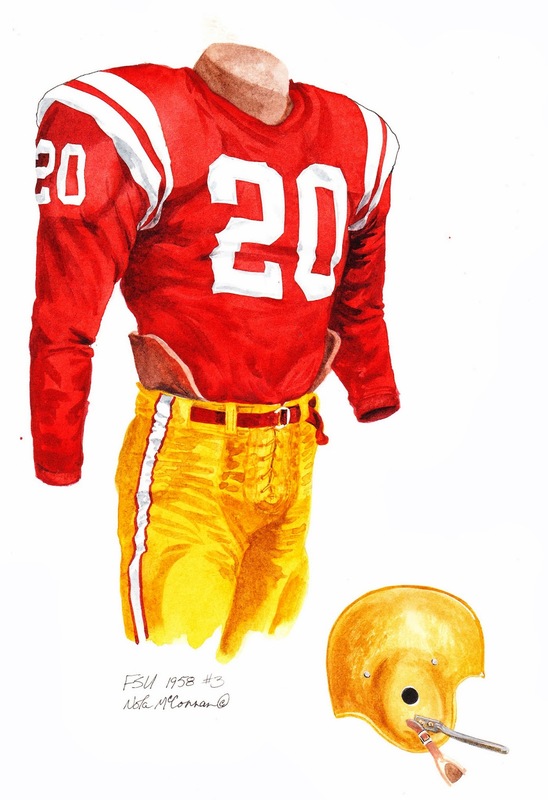 Renn became one of the most complete football players ever to wear the garnet and gold from 1956-58. By the time his career was over, Renn held FSU career marks in points scored, touchdowns scored, rushing yardage and punting. He not only ran and punted, he was also a brilliant defensive back, a fine pass receiver, and filled in at quarterback in 1957. The ’58 Seminoles were coached by Tom Nugent, his last season with the garnet and gold; he left Tallahassee for the Canadian Football League’s Montreal Alouettes. The Seminoles of 1958 wore garnet jerseys with two white stripes at the shoulders. White numerals adorned the sleeves, front and back of the jerseys. Players wore gold pants with white and garnet stripes down each leg. Players also donned gold helmets with garnet numerals on one side. This painting depicts the famous #25 uniform of Florida State University football great - Fred Biletnikoff. Biletnikoff enjoyed a stellar collegiate career and became FSU’s first consensus All-American in 1964. Here is what our friends at Wikipedia have to say about Fred Biletnikoff. The Erie, PA native played 14 seasons in the AFL/NFL. Biletnikoff is enshrined in the Pro Football Hall of Fame. Biletnikoff is enshrined in the College Football Hall of Fame. Biletnikoff is a member of the Florida State Football Hall of Fame. In 2000-01, Biletnikoff was ranked as the 111th best college football player of all time by The College Football News. The ’62 Seminoles compiled a 4-3-3 record under the tutelage of Head Coach Bill Peterson who patrolled the FSU sidelines for 11 seasons (62-42-11). The squad was captained by Gene McDowell. 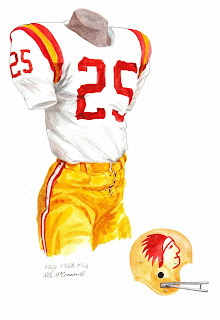 Seminole players in 1962 sported white jerseys with garnet numbering on the front, back and sleeves of their uniforms. Garnet and gold piping on the shoulders highlighted the impressive jersey. Pants were gold with garnet and white stripes down each pant leg. Seminole players may have worn three variations of gold helmets in 1962. It has been suggested that seniors wore one with an ‘Indian head’ design, the ‘tomahawk’ by juniors, and the ‘arrow’ by sophomores. 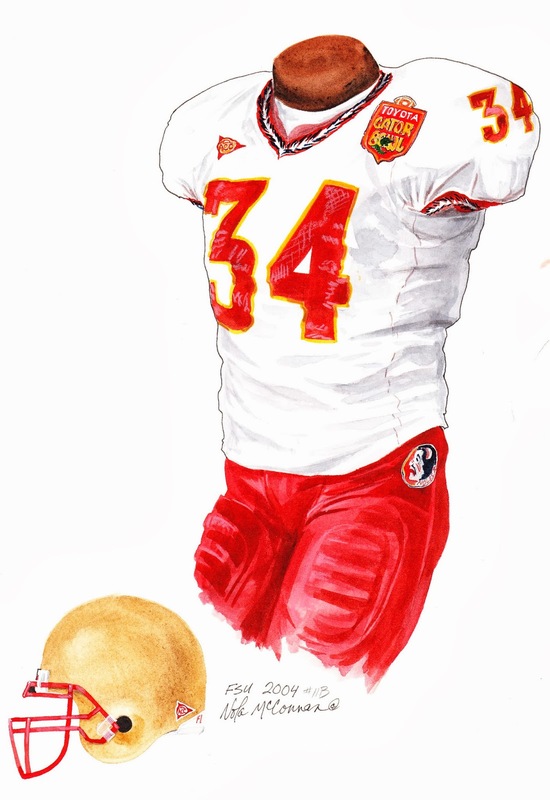 This painting depicts the #34 uniform of Florida State University football player - Ron Sellers. In 1967, Sellers was named a consensus All-America. As of 2006, Sellers still owned 14 Seminole receiving records. Sellers is enshrined in the College Football Hall of Fame. Sellers is a member of the Florida State Football Hall of Fame. Sellers played five seasons in the AFL/NFL. The ’66 Seminoles compiled a 6-5 record under Head Coach Bill Peterson who walked the FSU sidelines for 11 seasons (62-42-11). Seminole players in 1966 sported white jerseys with garnet numbering on the front, back and sleeves of their uniforms. Garnet stripes appeared above the elbow length sleeves. Pants were gold with garnet and white stripes down each pant leg. Players wore gold helmets with the word ‘State’ within an outline of the map of Florida on it. 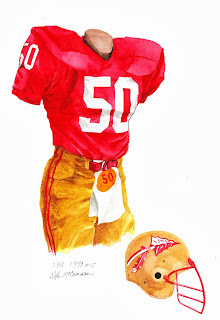 This painting depicts the #50 uniform of Florida State University football player - Ron Simmons, arguably the greatest defender in FSU history. He earned consensus All-America honors in 1979 and 1980, and was a finalist for the Lombardi Trophy in 1980. The powerful nose tackle led FSU to the top of the polls, into two Orange Bowls and a Tangerine Bowl and to four consecutive victories over Florida. He was the first defensive player in FSU history to have his number retired. Simmons parlayed a wonderful collegiate career into a successful professional wrestling career. Simmons is a member of the Florida State Football Hall of Fame. Here is what our friends at Wikipedia have to say about Ron Simmons. In 2006, Simmons was inducted into the Orange Bowl Hall of Honor. Under Bobby Bowden, the ’79 Seminoles won 11 games for the first time in the school’s history. The team’s only loss came to Oklahoma in the Orange Bowl on January 1, 1980. Seminole players in 1979 sported garnet jerseys with white numbering on the front, back and sleeves of their uniforms. Pants were gold with two garnet stripes down each pant leg. Players wore gold helmets with an arrow and feather as the symbol. This painting depicts the #4 uniform of Florida State University football player - Jessie Hester. The native of Belle Glade, Florida returned punts and played the wide-receiver for the Seminoles. Here is what our friends at Wikipedia have to say about Jessie Hester. 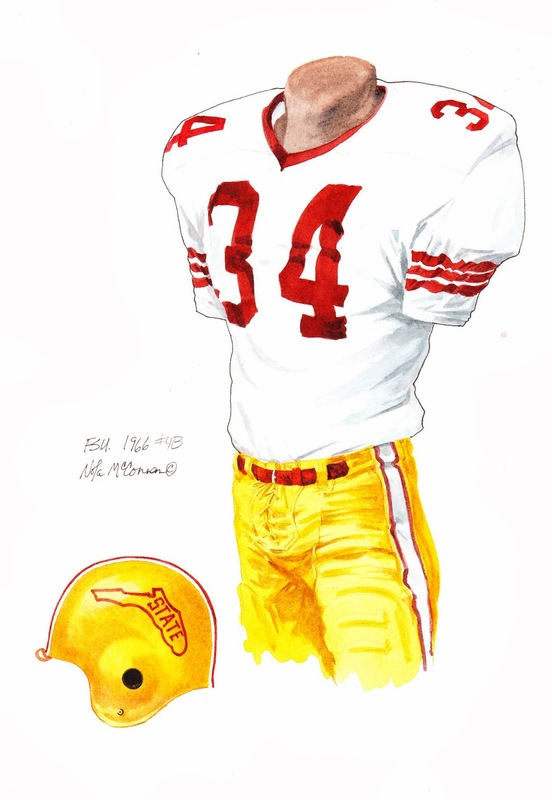 Hester played 10 seasons in the NFL from 1985 to 1995. The ’83 Seminoles compiled a 7-5 record under Head Coach Bobby Bowden. The squad defeated North Carolina 28-3 at the Peach Bowl on December 31, 1983. 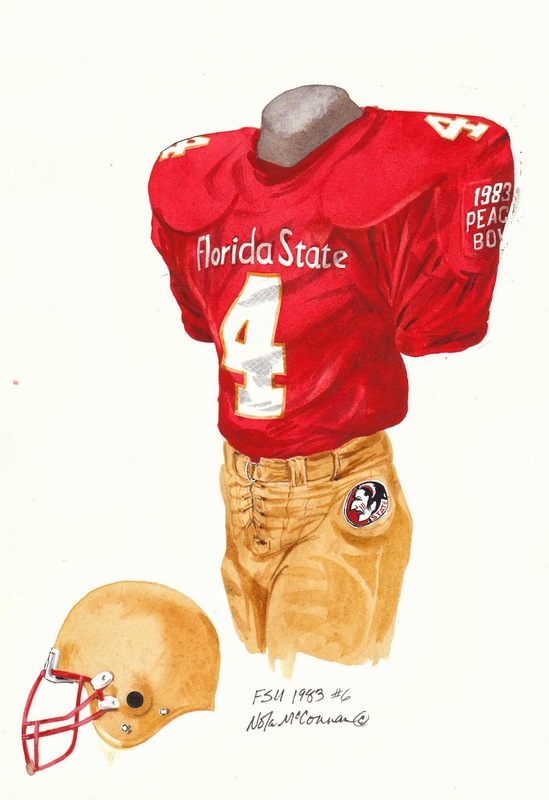 The Seminole uniform of 1983 featured a garnet jersey with white numbering on the front, back and shoulders. The words, Florida State appear on the front of the jersey. Pants were gold with a Seminole patch at the hip. Headgear featured an arrow and feather on each side of the gold helmet. 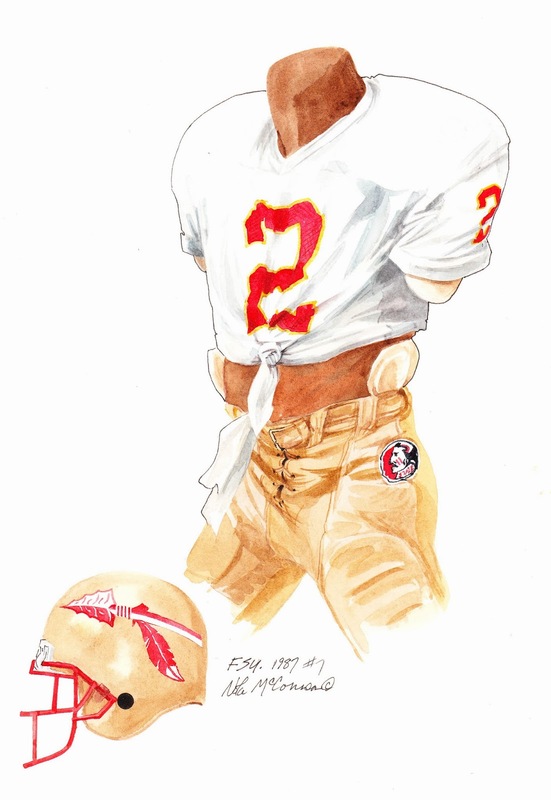 This painting depicts the famous #2 uniform of Florida State University football player - Deion Sanders. The native of Belle Glade, Florida is widely considered one of the finest athletes in professional sports history. As a freshman, he started at cornerback, played outfield on the baseball team which finished fifth in the nation, and led the track team to its tenth conference championship. A two-time consensus All-American in football, Sanders was the 1988 Thorpe Award winner as the nation's finest defensive back. In 2000-01, Sanders was voted as the 8th best college football player of all time by the College Football News. He was drafted by both the Atlanta Falcons and the New York Yankees and played both sports earning All-Pro honors with the Falcons, 49ers and Cowboys and excelled as a center fielder for the Braves, Reds and Giants. Here is what our friends at Wikipedia have to say about Deion Sanders. Sanders played 14 seasons in the NFL from 1989 to 2005. Sanders is a member of the Florida State Football Hall of Fame. Sanders played nine years of Major League Baseball from 1989 to 2001. The ’87 Seminoles compiled an 11-1 record including a 31-28 win over Nebraska in the Fiesta Bowl on January 1, 1988. FSU finished the season ranked #2 behind Miami. The white Seminole jersey of 1987 featured garnet numerals with gold trim on the front, back and sleeves. Players wore gold pants with a Seminole patch at the hip. Headgear featured an arrow and feather on each side of the gold helmet. FSU’s sole loss came on October 3 to eventual National Champions Miami (26-25). 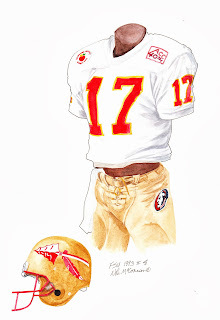 This painting depicts the #17 uniform of Florida State University football player - Charlie Ward, arguably the most decorated player in the history of college football. Ward won literally every award he was eligible for as a senior quarterback on Florida State's 1993 National Championship team. In addition, Ward was the sparkplug on three Seminole NCAA Tournament basketball teams. A native of Thomasville, Ga., Ward became Florida State's first Heisman Trophy winner in 1993. He also won the Davey O'Brien and Johnny Unitas Golden Arm Awards and was named Walter Camp Player of the Year and Toyota Leader of the Year. He is only the second college football player ever to win the Sullivan Award given annually to the nation's top amateur athlete. On the basketball court, Ward pushed the Seminoles to the brink of the 1993 Final Four, falling one game shy. He also started on FSU's Sweet 16 team in 1992 and hit the game-winning shot in its Metro Conference Tournament Championship game win over Louisville in 1991. Despite his amazing success on the gridiron, Ward went on to play 11 seasons in the NBA, mostly with the New York Knicks. In 2000-01, Ward was voted the 70th best college football player of all time by the College Football News. Here is what our friends at Wikipedia have to say about Charlie Ward. Ward is enshrined in the College Football Hall of Fame. Ward is a member of the Florida State Football Hall of Fame. Ward played 11 seasons in the NBA. The ’93 Seminoles compiled a 12-1 record including an 18-16 win over Nebraska in the Orange Bowl on January 1, 1993. The white Seminole jersey of 1993 featured garnet numerals with gold trim on the front, back and sleeves. 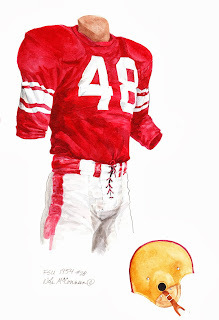 The jersey featured an ACC 40th Anniversary patch on the right shoulder and an Orange Bowl patch on the left shoulder which was worn on the New Years Day game. Players wore gold pants with a Seminole patch at the hip. Headgear featured an arrow and feather on each side of the gold helmet. Florida State was the National Champion in 1993 and they capped off their championship season by beating Nebraska 18-16 in the Orange Bowl. 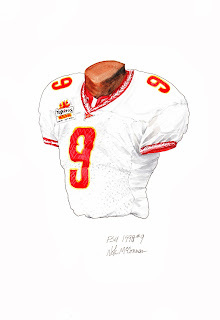 This painting depicts the #9 uniform of Florida State University football player - Peter Warrick. A native of Bradenton, Florida, Warrick was a two-time consensus All-American (1998 and 1999). Warrick excelled as a wide receiver, punt returner and even lined up at quarterback for the Seminoles. He was selected in the first round of the NFL Draft by the Cincinnati Bengals. In 2000-01, Warrick was voted the 124th best college football player of all time by College Football News. Here is what our friends at Wikipedia have to say about Peter Warrick. Warrick played six seasons in the NFL, five with the Cincinnati Bengals. Despite dropping a 23-16 decision to the University of Tennessee at the Fiesta Bowl, the ’98 Seminoles compiled an impressive 11-2 record. Florida State won the ACC title and finished 3rd in the AP Ranking. The white Seminole jersey of 1998 featured garnet numerals with gold trim on the front, back and shoulders. The jersey featured a Tostitos Fiesta Bowl patch on the right shoulder and an ACC logo under the ‘V’ of the collar. Players wore gold pants with a Seminole patch on each hip. Headgear featured an arrow and feather on each side of the gold helmet. The Seminoles lost only two games in 1998; an away loss to North Carolina State and a Fiesta Bowl loss to #1 ranked Tennessee. This painting depicts the #16 uniform of Florida State University football player - Chris Weinke. Chris was the first three-year starter at quarterback in the 22-year tenure of head coach Bobby Bowden. In 1999 Chris led the Seminoles to their first undefeated season and their second national title, he also led the Seminoles to three straight national championship games and complied a 32-3 record as the starting quarterback. During his Heisman winning season he led the nation in passing with 4,167 yards during the regular season for an average of 347.3 yards per game. Chris is one of two FSU quarterbacks to have his jersey number retired (the other being Charlie Ward). In 2000-01, Weinke was voted the 139th best college football player of all time by the College Football News. Here is what our friends at Wikipedia have to say about Chris Weinke. 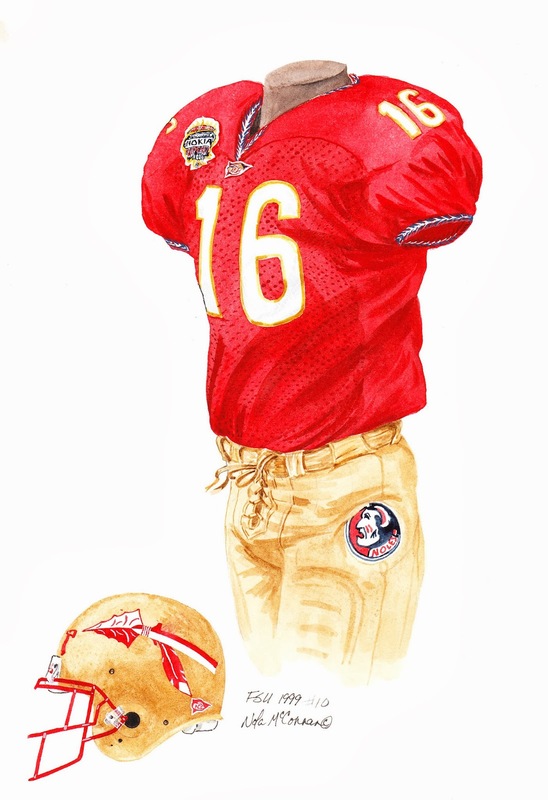 In 2000, Weinke joined Charlie Ward as the only Seminoles to have won the Heisman Trophy. He also won the Davey O’Brien and Johnny Unitas awards in 2000. Chris was drafted by the Carolina Panthers in the 2001 NFL draft and went on to play seven seasons in the NFL, mostly as a backup. Weinke played six years in the Toronto Blue Jays’ farm system before attending Florida State. The ’99 Seminoles accomplished college football’s first ever wire-to-wire run at #1 in the AP poll. The Bobby Bowden led ‘Noles defeated Michael Vick and the Virginia Tech Hokies 46-29 in the 2000 Sugar Bowl to secure a 12-0 record. The garnet Seminole jersey of 1999 featured white numerals with gold trim on the front, back and shoulders. The jersey featured a ‘Nokia Sugar Bowl’ patch on the right shoulder and an ACC patch under the ‘V’ of the collar. Players wore gold pants with a Seminole patch on each hip. Headgear featured an arrow and feather on each side of the gold helmet. Florida State was the National Champion in 1999 and they capped off their undefeated season by beating Virginia Tech 46-29 in the Sugar Bowl. 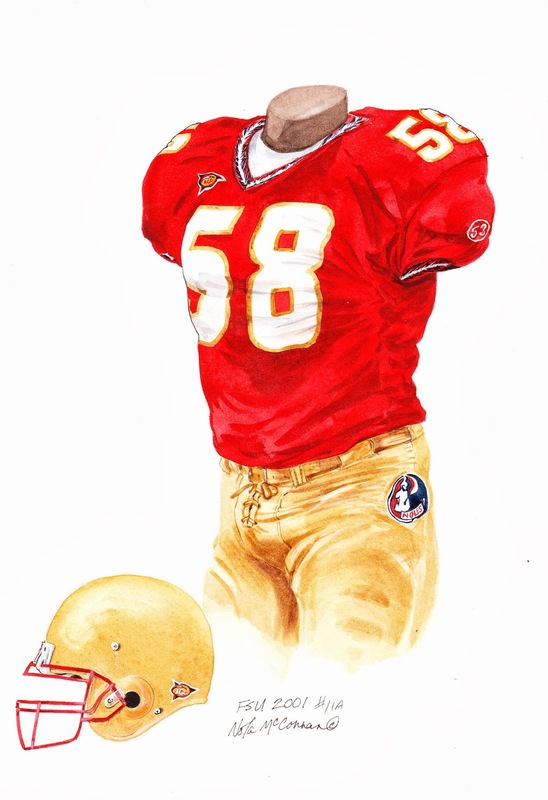 This painting depicts the #58 uniform of Florida State University football player - Michael Boulware. Michael is a native of Columbia, South Carolina and started every game in 2001 at strongside linebacker, and was an All-America candidate in his senior year. Michael’s brother Peter, also attended FSU and is a member of the Florida State Hall of Fame. Here is what our friends at Wikipedia have to say about Michael Boulware. Michael was drafted in the 2nd round of the NFL Draft by the Seattle Seahawks. Seattle traded Boulware to the Houston Texans in 2007 and he wrapped up his NFL career in 2008 with the Vikings. The 2001 Seminoles compiled and 8-4 record and finished the season as the #15 ranked team on both the AP and USA Today/ESPN polls. The garnet Seminole jersey of 1999 featured white numerals with gold trim on the front, back and shoulders. The jersey featured an ‘ACC patch on the right shoulder. Players wore gold pants with a Seminole patch on each hip. Headgear featured an arrow and feather on each side of the gold helmet. This painting depicts the #34 uniform of Florida State University football player - Ernie Sims. Sims wore the #34, a number that was retired in honor of former Seminole football player, Ron Sellers. Sellers gave Sims and the University permission for Sims to wear the jersey number. Here is what our friends at Wikipedia have to say about Ernie Sims. Ernie was drafted in the 1st round, 9th overall by the Detroit Lions in 2006 and in his 1st year in the NFL appeared in all 16 games as on outside linebacker. His NFL career is summarized here. The ’04 Seminoles compiled and 9-3 record and finished the season as the #15 ranked team on the AP poll. The white Seminole jersey of 2004 featured garnet numerals with gold trim on the front, back and sleeves. 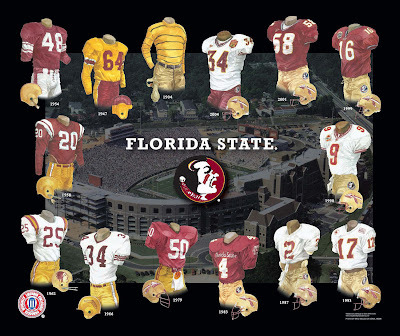 The jersey featured an ‘ACC patch on the right shoulder and a ‘Toyota Gator Bowl’ patch on the left shoulder that players wore on the January 1, 2005 game that FSU won 30-18 over West Virginia. Players wore garnet pants with a Seminole patch on each hip. Headgear featured an arrow and feather on each side of the gold helmet. 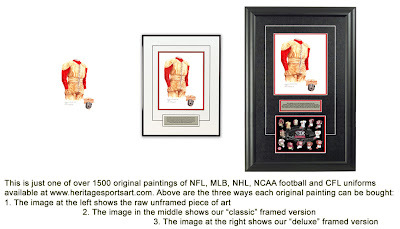 If you love Florida State and the history of Seminoles football, you might really love to own an original piece of artwork celebrating the team's historic uniforms as seen in the poster at the top of this blog - you can actually own one of those original pieces of art! There are only 14 pieces of original art available for sale, and when these 14 are sold, that's it, they're all sold out. 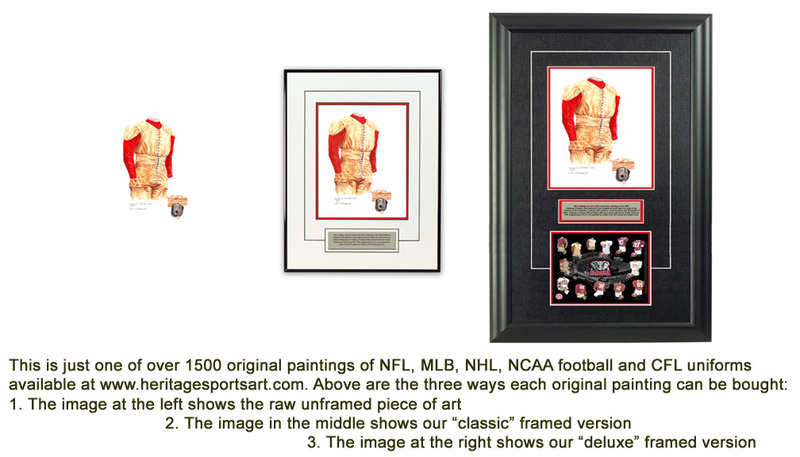 If you would like more information about this great artwork including the three ways you could purchase each piece, please visit our FSU Seminoles YouTube video at www.youtube.com/watch?v=ZVu1f5b4yKM or go directly to the artwork website www.heritagesportsart.com/Florida-State-Seminoles-c83/ where you can see and purchase the artwork.